In fact, the design simply burst forth from the imagination of a baron with effulgent facial hair. Baron Coubertin believed in sport as a kind of religion “with its own church, dogmas and ritual.” And when he cast about for a logo, he may have been inspired by — of all things — an advertisement for Dunlop tires. The baron had been perusing a magazine illustrated with five bicycle tires at around the same time that he invented his design, according to the historian Karl Lennantz. Good to know that “effulgent facial hair” and bicycles have been linked, however tangentially, for a long time. 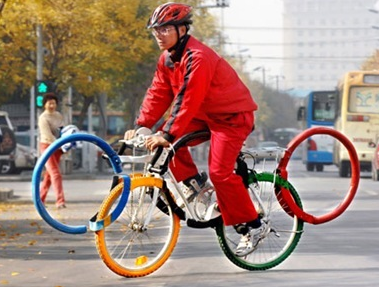 Olympic committee would confiscate that vehicle for copyright reasons.